Up From the Top: Spring What?? It’s been a very long time since I have created a new post. Many wonderful and exciting things have transpired, but I just could not get myself on task to write about them. So today I want to relive a Christmas Memory that is of particular meaning to me. I have many more memories that I will attempt to share in the coming months. When I was just becoming of school age our home was located beside that of my Aunt Bessie and Uncle Hal. My father was the last of 14 children and Uncle Hal was the eldest. Due to the age difference, and our proximity to them, they were pressed into service in the role of the Grandparents that we never knew. I have fond memories of the Springerle Christmas cookies Aunt Bessie would make each year in her Germanic tradition. One year I was reminiscing about this to my Mom who then mentioned it to Aunt Bessie. Soon afterward her cookie molds arrived in my mail. Aunt Bessie is now gone. In many recent years I have enjoyed attempting to use her molds with mixed success. I have added to the two molds which I received from her. Sadly the vast majority of the very poor quality flat and rolling pin style molds now available either have been produced for the mass market with little or no craftsmanship, or they are cast replicas of authentic molds from the period when they were made by local craftsmen. A few years back I found this wonderful source of Springerle cookie information and high quality molds individually made in the old tradition but using modern tools. I am delighted to be able to use them and hope that someone in the family will carry on this tradition when I am no longer able to. 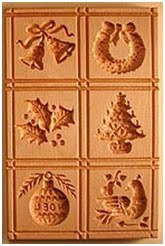 My Favorite stamps are the 12 days of Christmas which I have both as a set and as individual stamps. The world celebrates Christmas for twelve hours, but the Church celebrates it for twelve days because the gift of Christ is with us for twelve months of the year. When most people hear of “The 12 days of Christmas” they think of the song. The song had its origins as a teaching tool to instruct young people in the meaning and content of the Christian faith. The song’s GIFTS are hidden meanings to the teachings of the faith: The “true love” doesn’t refer to an earthly suitor, but rather refers to God Himself. The “me” who receives the presents refers to a Christian. 4. The “four calling birds” - the four Gospels that sing the song of salvation through Jesus Christ. Hey, look at that! You still blog! Glad to see you're still around and blogging! What interesting information, thanks so much for sharing. I will forever look at the song differently.